Need to wow your group? 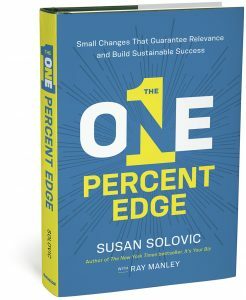 Popular speaker, consultant, and authority, Susan Solovic delivers the ‘One Percent Edge’ that builds innovation, profitability, and competitiveness into a company’s DNA. There is no such thing as “business as usual” any longer. Your profits, your brand, and your customers can disappear in an Internet minute. So how do you keep from losing ground? How do you stay a step ahead of competitors? The solution is surprisingly straightforward: continual innovation tweak by tweak. Researching and writing this book has been a long labor of love. In it I share hundreds of strategies, examples, and my six-step process: The One-Percent Edge. Armed with the secrets of The One-Percent Edge, you will be positioned for success today and tomorrow – no matter what the future brings. Get your copy today at Amazon, Barnes&Noble, IndieBound, or from the publisher, AMACOM, where you’ll find a free sample chapter. When Susan sits down to talk with today’s top business leaders from virtually every industry, insider tips and strategies are revealed. Don’t miss a single episode of Susan’s new podcast. Click here to catch her latest episode and access her achieve of previous episodes. Susan Solovic motivates, inspires, and provides valuable insights of how to be a extraordinary entrepreneur. Susan provides “entrepreneur-changing” and valuable small business advice that allows any small business owner to take their business to the next level, face the obstacles, and succeed in any economy. The presentation was spectacular and one of the best we have ever had. Your entrepreneurial spirit resonated well with the crowd and several in attendance could identify with you and your journey of starting up a small business. The “sparkling success strategies” you shared are true business gems on how to run a successful organization. I have had the pleasure of seeing Susan as a keynote speaker to entrepreneurs across the country on a number of occasions. Susan provides simple strategies that businesses can implement tomorrow that will have an immediate positive impact. She is engaging, personable and captivating, so it’s no surprise she gets rave reviews time and time again. As an entrepreneur myself, I was really interested in Susan’s thoughts and ideas to run and grow a business especially in a highly competitive marketplace. Not only did she made very valid points around the importance of creating value for customers and having a differentiated product but each real life example she took was spot on and gave a true color to her keynote.